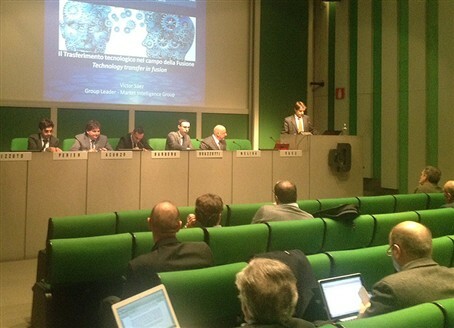 Organisers and invited speakers explaining the ITER business opportunities for Italy’s companies in Piedmont. An information day highlighting the business prospects of ITER was organised by Cofindustria Piemonte, the confederation of industry operating in Italy’s northern region, in collaboration with AMMA, the Turin Association of Metal and Mechanical Industrialists, and ENEA, the Italian National Agency for New Technologies, Energy and Sustainable Economic Development. ENEA’s expertise in fusion R&D spans decades of successful collaboration with other European laboratories and companies. Similarly, the potential of Italy’s industry, SMEs and research organisations can be witnessed through their prominent contribution in the fields of ITER magnets, the vacuum vessel and the Neutral Beam Test Facility located in Padua. To put things in perspective, tenders led by Italian economic operators have a 45% sucesss rate and on average a value of 20 million EUR. The industry operating in Piedmont is leading by example which explains why Cofindustria Piemonte was keen to organise an info day for its industrial base. The region ranks first, managing 34% of Italy’s share of ITER contracts for a value of 300 million EUR, and has a solid track record in the field of mechanical engineering. Is there scope for improvement and how could those not yet involved become part of the ITER family? More than 40 representatives from different companies were there to learn from F4E’s Benjamin Perier and Victor Saez what are the different tender processes and what kind of business opportunities lie ahead. During their presentation they both highlighted the valueable information availble on the Industry and Fusion Laboratories portal and stressed the importance of maintaining regular contact with the Industry Liaison Officers (ILOs) who can channel the business information in a direct and efficent way. Paolo Ancunzo, Italy’s ITER ILO, presented the tangible commercial benefits stemming from the international energy project, elaborated on some industrial success stories and encouraged companies to be pro-active. To view the presentations of all speakers click here.